is a species of jasmine native to South and Southeast Asia. 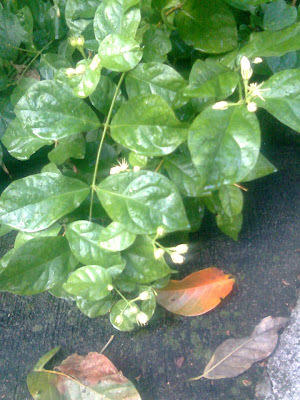 It is a small shrub or vine growing up to 0.5 to 3 m (1.6 to 9.8 ft) in height. It is widely cultivated for its attractive and sweetly fragrant flowers. The flowers are also used for perfumes and for making tea. It is known as the Arabian jasmine in English. It is the national flower of the Philippines, where it is known as sampaguita. It is also one of the three national flowers of Indonesia, where it is known as melati putih.
. Jasmin, Jasmine (jasumin) .